I was finishing arranging the final details for the goodybag from sponsor Amutey DeCuir, transferring the right landmark and logo to use. The logo caught my eye; full of nice chic evening gowns, no doubt what you can expect from *BLiss Couture*. I told Amutey I will keep her landmark for upcoming celebrations – a girl needs to be prepared and have an inventory filled with good landmarks of high quality shops. But Amutey DeCuir did not stop there, she also gave me a gown from her collection called *BLiss Couture* – Christina Gown (Blue). Thanks to Aleida Rhode for taking the picture. And her logo does not lie! It reflects what it promises: a very chic, elegant dress. The Christina Gown is made from soft shining silk, that gives the design a very luxurious look. The halter top is fixed on the neck with a long bow, which simply calls for an up-do hairstyle. With every step, you can see and feel the smooth flow of the skirt. I am anxious to see what Amutey will put in the goodybag of the Runway Diva show and she is also going to sponsor the lucky winner. It’s really a great prize to win. Must have that goodybag from *BLiss Couture*? Simply join the EWING Event VIP guest list in-world. I know you shopaholics too well, you can not wait, so visit *BLiss Couture* today! If you are interested in being a goodybag sponsor, contact Connie Molinaro for more information. There are upcoming events available. We have 100,000 blog hits! This is a landmark achievement for any blog and especially for us. The blog has developed so much since it was first introduced to the fashion world. We are so very grateful to everyone who has offered their continued support, the amazing staff, both past and present, and to YOU, the readers. This would have never happened without you, and so we have got ALOT in store for you all to celebrate with us. -* A VERY big competition for all of you artistic and creative avatars that will offer amazing grand prizes for the winner. -* A themed (soon to be released!) celebration party for everyone! -* And, many more suprises you won’t want to miss out on! 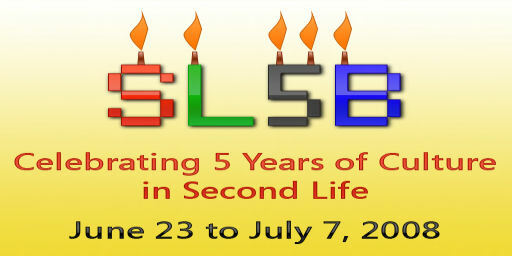 From June 23rd to July 7th, Second Life will be celebrating its fifth anniversary. To mark this event, a number of designated sims were allocated to exhibitors. Ewing Fashion Agency’s application was approved and with access to the “fashion” sim with less than three days before the sim opening, the race to complete the ehxibition was on. Agency boss Una Ewing, decided to fill the 8000+ SQM plot with her “favorite things” – including much of what that the agency consist of, like elements of the blog, the school, the magazine, a fabulously long and outlandish runway and event showcasing area, an art exhibition, which will all be unravelling over the next few days. There will also be an area for shop owners and vendors to “place” their brands. “I was so excited when our application was approved. Building and decorating the structure was a challenge, but I had it done in less that 24 hours once I got started and we can now look forward to the events themselves”, a very excited Una Ewing said this afternoon. As always, the team at Ewing have rallied around this event and together they have put together some pretty exciting plans that will be unfolding over the next two weeks, including events such as Runway Robics, Runway Divas, Fashion Shows featuring Leezu Baxter, Sissy Pessoa and many other names. If you are interested in fashion, career development, training, writing for a magazine, blog, broadcasting or just plain fashion events, be sure to drop by and have a look and a chat – their friendly EFA staff will be at your disposal.